On Friday night, November 13, I had just left a movie theater near my home in Toulouse, France, when I received an e-mail from a friend asking me if I was OK. Curious, I went on Twitter and immediately saw reports from French news agencies that there had been a series of attacks across Paris. My first reaction was to try to follow the Twitter stream of the events based on any emerging hashtags. I looked at what was trending in Toulouse and nothing pointed me to the attacks. I soon saw that #fusillade, which means “shooting,” was trending. I began to receive a lot of requests from American friends for more news, so I began to tweet in English with another hashtag being used by both French and English Tweeters: #ParisAttacks. Others started to use the French version #AttaqueParis. Because there were so many ongoing immediate crises across Paris within the first 24 hours, very specific hashtags emerged to meet a variety of needs. These included #PorteOuverte, where people were opening their doors to people who needed shelter, and then the heartbreaking #RechercheParis to search for family members and friends missing after the attacks. Over the next few days, I began to notice dozens of other hashtags around the event. As I was trying to sort out my reactions, questions, and responses to the attacks, I realized that the lack of a unifying hashtag similarly reflected the complex reaction in France and around the world. 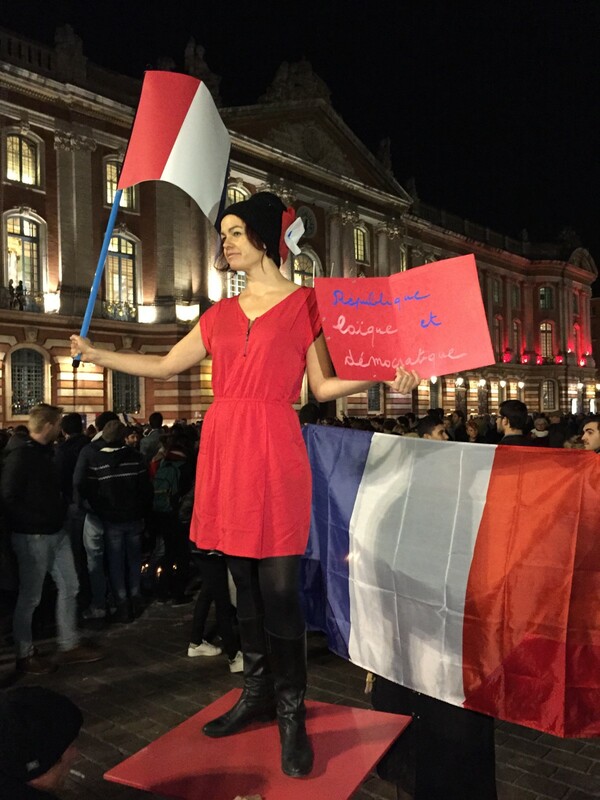 After a memorial outside of the Toulouse Capitole on November 17, 2015. As a sociologist who studies social media, activism and politics, I had observed a dramatically different response to another Paris attack just seven months earlier. #JeSuisCharlie quickly struck a chord with people worldwide and began trending within hours after the shootings at the headquarters of the satirical magazine Charlie Hebdo. While not universal, most symbolism afterwards revolved around freedom of expression and speech. This included not only the hashtag but also much of the artwork and chants at protests, memes on the Internet, news media coverage, as well as private conversations I had with my French neighbors and co-workers. It was a unifying response. Even though the January shootings also left 4 dead at a Kosher supermarket, the primary message received from the this attack were that journalists and provocative speech should be on guard — and protected. But Friday’s attacks were much different and much broader. And as a result, the lack of a central hashtag reflects a complex set of responses that are much more divided than January’s. The latest attacks affected the core of French social life: restaurants, bars, music, and soccer. In other words, we all are targets and can be at any time anywhere, not only journalists. This is the point of terrorism. So no longer are the French defending only freedom of expression, but they’re also questioning how to live on an everyday level — and what to do next. These broader targets have resulted in more general hashtags such as #attentats (bombing) or the location of the most publicized and deadly target, the #Bataclan music club. 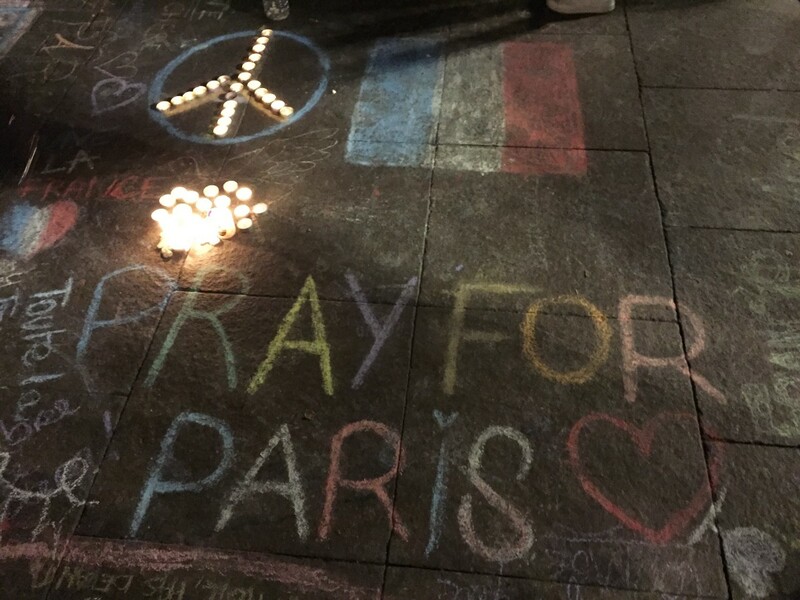 In front of the Toulouse Capitole people have been chalking their complex reactions. Yet none of these hashtags has any hint of a clear political or social movement agenda to respond concretely to the attacks. Within four days after the Hebdo attacks, millions of French people participated in protests around the country, often with #JeSuisCharlie on home-made signs. The hashtag was vague but it did give a nod to how people supported France’s beliefs in liberté and laïcité — freedom of speech and from religion. #JeSuisCharlie was also proudly displayed on many government buildings, as well as on the lips of politicians. Despite the irony of the state embracing a magazine that has critiqued this very type of co-optation, this fragile, multi-layered and multi-meaning hashtag still reflects some unity. But now, this type of unity is missing as people search for answers. While French citizens wrestle with what happened and what to do next, Hollande has proposed Patriot Act type measures, such as tightly controlled borders and limits on newer French citizens. He not only called the attacks an act of War, but he responded with bombing (supposed) ISIS strongholds in Syria. Hashtags have begun to emerge around these simultaneous calls for peace and tolerance or war and discrimination, yet none have become dominant. 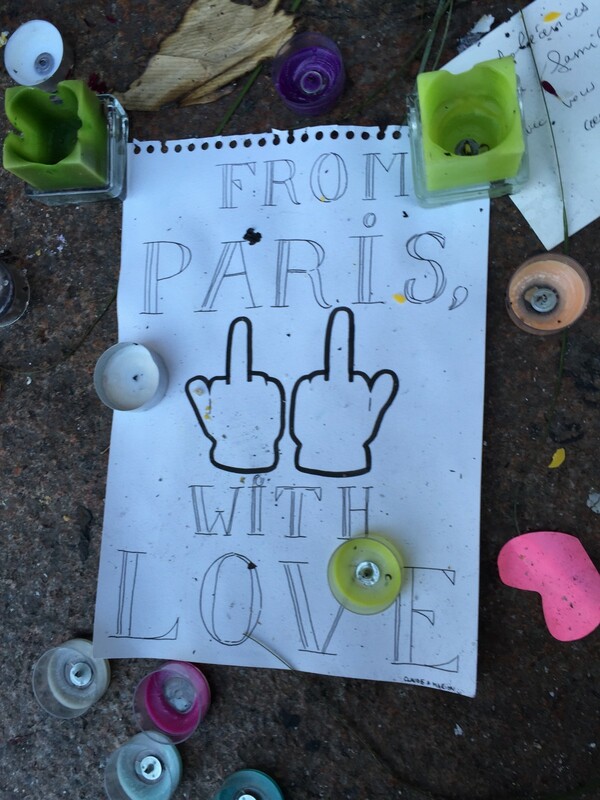 Sign among thousands at the Toulouse Capitole memorial site. My research demonstrates how little Twitter represents everyday political practices of civic and social movement groups, yet in times of crisis and events, Twitter can be a useful tool to understand trends to further investigate what’s on the ground. It’s still early, but there is no central response nor hashtag to go with it. This is a new situation that has created chaos, confusion and division, not just in France but worldwide. My osteopath summed up the dilemma. Like many conversations I’ve had with people over the last few days, he was literally wringing his hands asking himself what he would do during a terrorist attack. He said he wants to be trained by the military in how to respond, but probably without a gun, but maybe he’d join the reserves. Maybe not. “To save others, I may have to hurt someone, but I am also a healer. I know it’s a contradiction,” he said. Hashtag solidarity has limits, and in France right now that limit is that it’s anyone’s hashtag.